Like something out of the Back to the Future movie franchise, Orrcon Steel has created a virtual experience of its Structural Steel Manufacturing site with 360-degree compatibility. This interactive and engaging video showcases steel manufacturing in a way that’s never been seen before. The viewer has full control of what they see and it provides an unprecedented viewpoint of the manufacturing of Orrcon Steel tubular products. This experience enables you to see steel manufacturing from every angle. 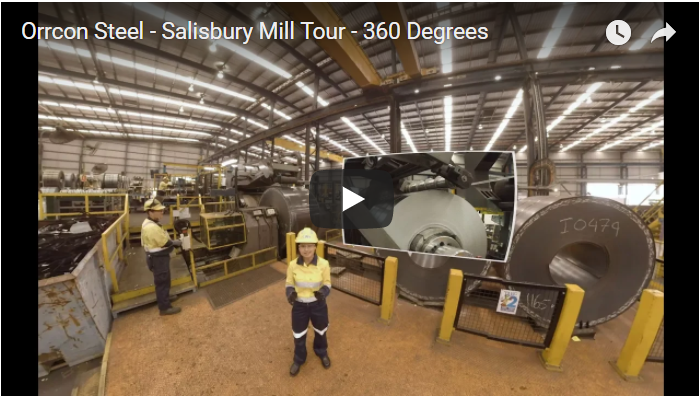 By simply moving your smart phone, tablet or desktop mouse, you will be able to take a virtual tour of our Salisbury Mill and the manufacturing process. Engage in this unique experience at www.youtube.com or www.vimeo.com. Whilst this video can be viewed on compatible desktops and mobile devices, to get the most out of this experience we recommend using a Virtual Reality (VR) Headset with smartphone VR compatibility. Place the VR headset on, insert your smart phone and explore Orrcon Steel’s Structural Tubular Mill from every angle. When using Desktop, the 360 video is best viewed on Google Chrome*. If you’re using a phone or tablet, the 360 video is best viewed on YouTube, Facebook or Vimeo apps. Please be aware of your surroundings. Orrcon Steel strongly recommends being seated for this experience for safety reasons!! We encourage you to share this video experience with your staff and customers that are interested in the detailed process to transform steel coil into tubular product. * Please note the 360 video is not compatible with Internet Explorer.